This week has been an incredibly tough, but rewarding, week. After hiking 26.2 miles last Saturday into Erwin, TN we spent the night at Uncle Johnny’s campground where we had sent our resupply box. We ate a hardy breakfast at Huddle House (including sausage for Bear) and set out on the 68 mile section to Hot Springs, NC. As we have learned over the past 1,900 miles, each town stop ends with an uphill climb back into the mountains. This was no different. 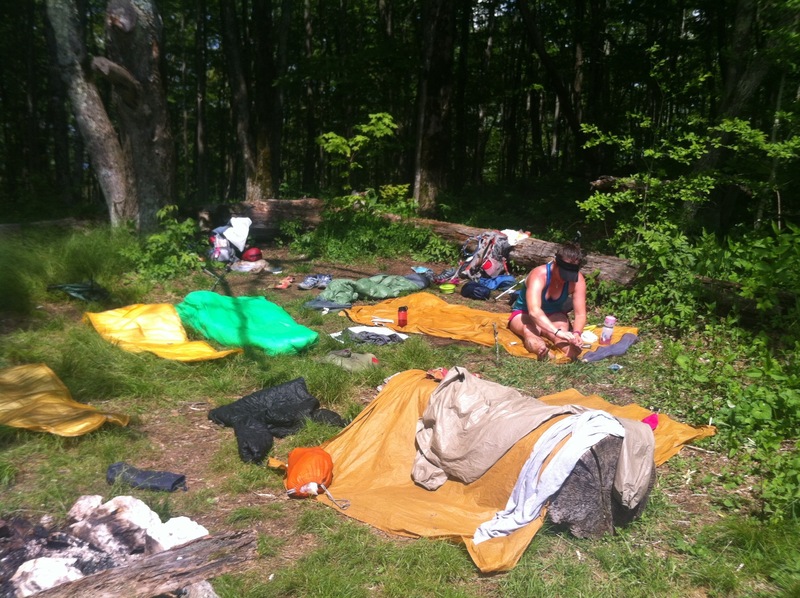 With full packs, full bellies and brand new shoes we had shipped ourselves we were struggling. It has become a seemingly impossible task to make ourselves hike more than 10 miles out of town, and Sunday was no different. 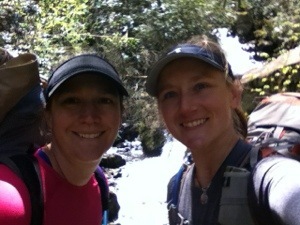 We got 9.5 miles before finding a beautiful stream to camp by and enjoying some cheddar broccoli pasta for dinner. 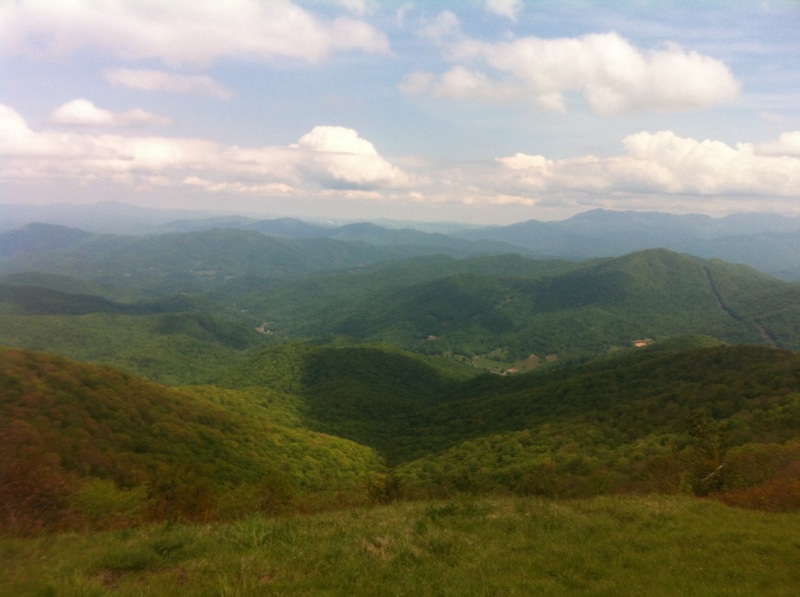 Monday we fared better, hiking 17.5 miles including lots of climbing over Little Bald and Big Bald, which included incredible 360 degree views. 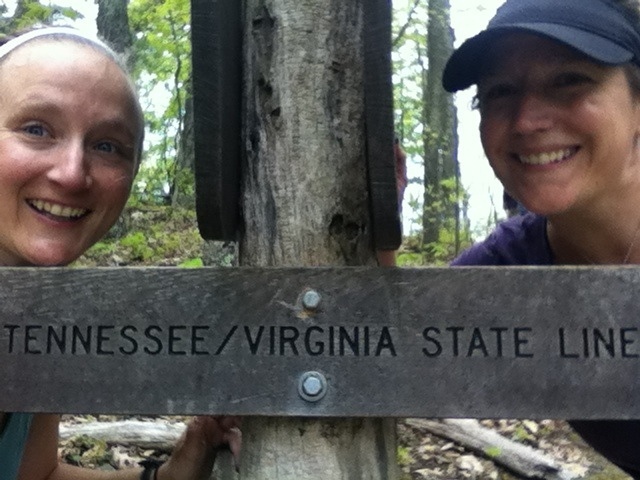 We even got to enjoy some southbound company in the form of two section hikers, Sarah and Tammy. It has been a little isolating to be the only hikers going our direction and over the next three days we got to enjoy the comradery of leap frogging with other folks and sharing food (mainly them sharing with us beggars thru hikers!). Tuesday we did 14.7 miles from Hogback Ridge Shelter to Jerry Cabin Shelter, including breaks to dry our tent out in the sun after a spontaneous rainstorm soaked everything the night before. Unfortunately, by this time it had become very obvious that Emily’s new shoes were too big and the little “hot spot” that had started Sunday had become a full-blown blister. Morning wound care was soon introduced and became TID (3x a day) by the next day. Huge props to her for not letting it slow her down one bit and continuing to knock out the miles! Wednesday started off with 5 miles of beautiful cliffs and some more technical terrain over to Camp Creek Bald, before we descended 6.5 miles into Allen Gap. There we enjoyed some sodas from Mom’s Store while chatting with Sarah, Tammy and some bikers touring from Florida to Canada. Then we proceeded to climb the last 7 miles of the day before camping on Rich Mountain and enjoying some dehydrated meals including a ridiculously good chicken, potatoes and dressing with breadcrumbs. Yum! This morning we got up at 8am (our usual wake up time) and had tea and pastries before knocking out the last 8.2 miles into town. We hadn’t been able to find a dog-friendly place to stay and were getting stressed out about possibly being unable to “zero” tomorrow. 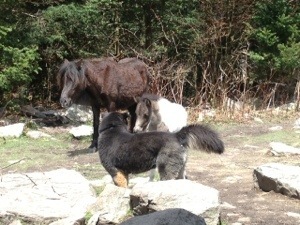 Luckily, we walked right into Iron Horse Inn and they welcomed Bear along with us for two nights. 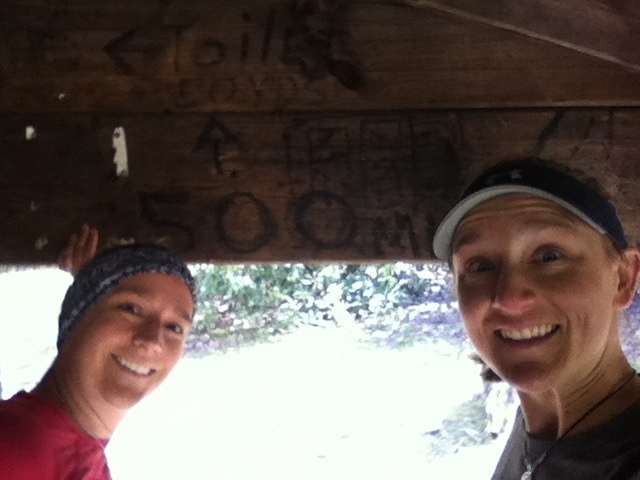 Again – the trail provides! Now we are off to nap (and time off our feet for blister healing) before heading out to enjoy some beers by the river and then a long night’s rest! Here are some photos including some views from Big Bald, our “yard sale” drying method for our gear, and Bear and I cuddling up. Also included is one of Emily’s blister- not for the feint of heart! 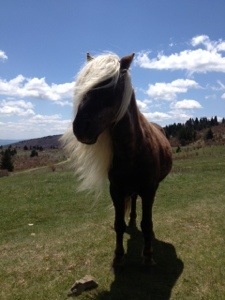 Well, we are now at a place in Roan Mountain, TN. I have never been here, but have read a lot about eastern Tennessee as I have dabbled in my love of Appalachian folklore and life. It is a very beautiful part of the country. Green mountains, gorgeous trail, and spring fed hollows. It is simple in its beauty with untouched mountains and a sparse population. This is the part of the trail where it gets the reputation of being a “green tunnel”. The trail has a life of its own as it meanders down the coast, and it also has its own bit of magic that is rarely talked about off the trail. We have explained before about trail magic and trail angels. However, there is another saying amongst hikers and it is that the “trail provides”. It sounds hokey I know, but I swear it is true. You just have to put it out into the universe and chances are you will get what you need. We, of course, have examples. Most recently we experienced the trail providing for us in Damascus. We had always planned on staying in and zero-ing in Damascus. We had never even considered that we may be there during Trail Days. 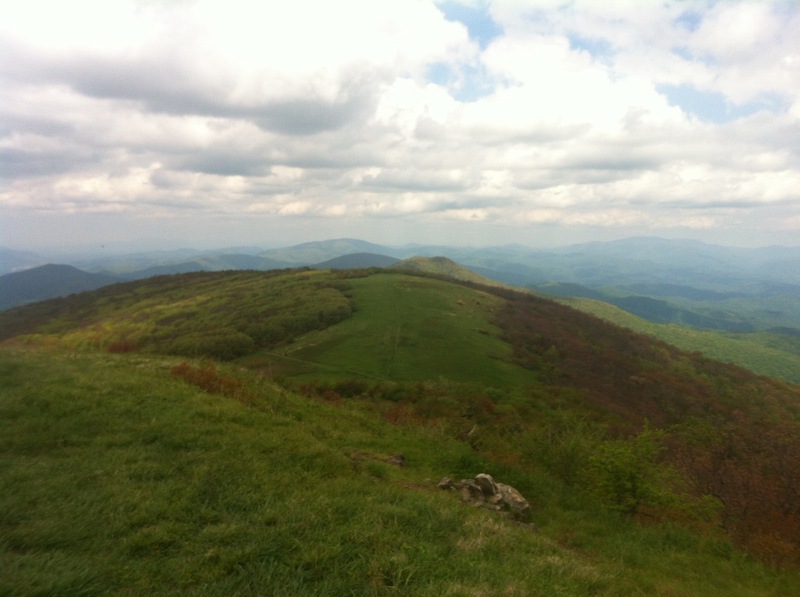 (A festival for hikers and vendors.) For a hiking town Damascus is surprisingly not dog friendly. There is a hostel there that accepts dogs but when we called for a reservation they were booked. So our new plan was to hike in, get our box, and hike out to the other side of town. For no real reason we ended up taking an extra day to get to Damascus. As luck would have it that extra day allowed for a vacancy at the hostel. We had a half day into town, an enormous meal, and a hostel with Internet! This proved to be awesome because it allowed me to Skype with my husband, and Jen to “FaceTime” with her boyfriend. We were happy girls. (The ice cream sundaes we had for dinner may have also helped improve our moods.) We needed a place to rest and refuel, we were sure it was not going to happen, and as we walked by the hostel we noticed a vacancy sign. It was early in the day and there was room in the Inn. The trail provided. Another example. 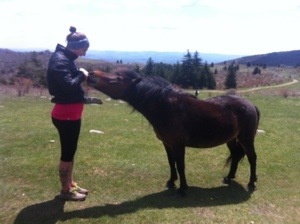 On our last day in the Grayson Highlands we had cut our food quite short. Somehow we had not put lunches in our last drop. We are not sure what happened but we suspect somewhere we will have double lunches. When that happens it will be less of an issue. Too little food proved to be a challenge. My poor hiking partner was starving. I was hungry, but Jen just does not have the fat reserves that this lady has and it was quite difficult for her to keep her energy level high enough to sustain the hiking we were doing. After a meager breakfast we set off down the trail with our empty food bags. 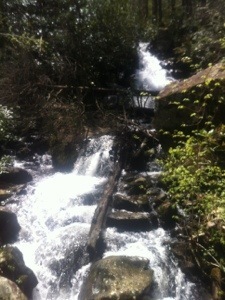 Then, about 4 miles in, there was trail magic! 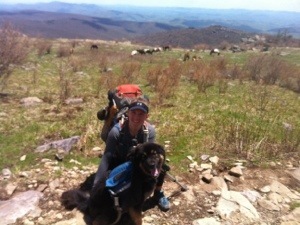 Polaris, a thru hiker from last year, was there to support his moms current thru hike. His dad had driven in coolers of drinks and food! They were super friendly and encouraged us to take some food for the road…and we did. That day we went from having nothing to having too much. It was truly amazing. We were hungry, and then we were not. The trail provided. Now for an obscure example of the trail providing. 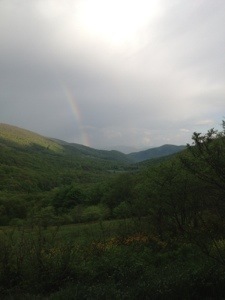 Somewhere in the Northern part of this journey I received an impossible gift from the trail. A tiny screw. My phone case is water proof. Where the head phone jack is there is a watertight screw. The case comes with a replacement plastic screw in case you lose the metal one. Well, I lost the metal one and then the plastic one. We were in a very rainy patch and I was worried about my phone. I keep it in my hip belt pocket to use the camera. 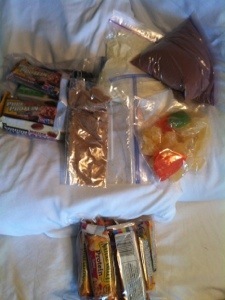 At that particular time we did not have an extra zip lock and my phone was vulnerable. So that evening in the dark of the shelter I looked to my left and what did I see? A screw for my phone case! I asked everyone who was there if it belonged to them and no one claimed it. Magic! My phone was saved. I like to think that the screws I had lost showed up to replace the hardware I now use for my phone case. This little guy has been with me since. It is in my case now. Once again, the trail provided. I know this may sound silly, but believe me it is not. Last, but most definitely not least, was a time in Maine. I was sick. Not the call out from work sick, but the I need to get to the hospital sick. I had been running a temperature way above 101 for almost two days, been very ill multiple times, had not had a shower in at least 7 days, and had been deliriously resting in a tent while my hiking partner did her best to care for me with what she had. It was not much. We managed to get to a “road” sandwiched between two mountains. No cell service. No cars. Then as we were trying to figure out what to do, a family showed up. After talking to us for a bit they decided to cut their trip in half and take us to the hospital. So, these total strangers loaded up two dirty hikers and a dog and took us to the closest hospital. I cannot thank these people enough. When in need I was provided true Trail Angels. I am laying in a top bunk of a hostel as I write this. You heard right, top bunk. So when the headline reads “AT hiker dies in tragic bunk bed accident” you will know it’s true. I feel there should be laws about people over a certain age sleeping in bunk beds, but when you’re basically homeless any bed will do. Actually the hostel in Damascus is quite lovely despite the bunks. We are staying at a place called the Hikers Inn and we are grateful for they allow our 4 legged companion to stay with us. They even have a dog bed! 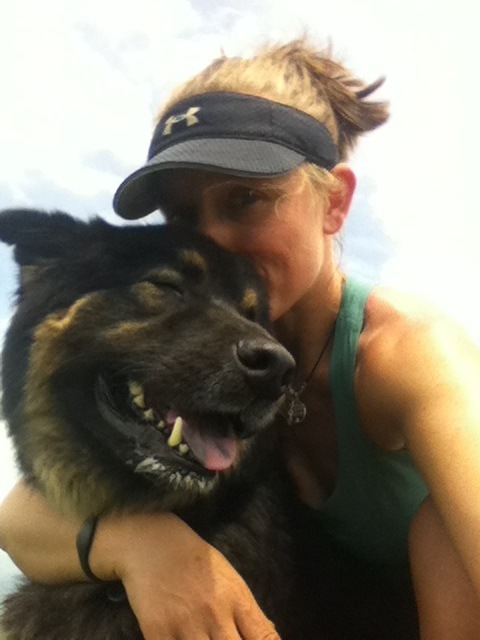 I know my hiking partner posted a recent update so I will spare you a repeat of those details. What I wanted to talk about were the small changes that have taken place from the beginning of our journey until now. Some friends have inquired about the differences so I will tell. One of the main changes we have made is in terms of mileage. When we first started last June we wanted to do big mile days. Our first day on the trail was 25 miles. We were doing fine until all of our little issues started to build up. Swollen/infected feet, porcupines, abdominal problems. So, we started a series of high mileage days followed by low or no mileage days. We struggled with consistency. What we found out around Pennsylvania is that we really liked days around the 18 mile mark. This amount of miles left us feeling like we covered significant ground but also have us time to enjoy views and smell flowers. So during these southern states we are trying to learn from this. We were doing well, but this last week resembled mileage from our earlier months. Big, big, nero, big. So we have used the time in Damascus to come up with a plan that is consistent in hopes to accomplish timely miles and be nice to our bodies. We made very few changes to our gear. I bought a new 20 degree synthetic bag for the wet spring, and in anticipation for the PCT next year. I love the bag and have been happy on wet mornings. Jen kept her 1+ season bag and added a liner. The liner is a thin piece of fabric that adds 15 degrees of warmth to her down bag. She too is happy and warm. I plan on getting a liner as my summer cover as we head further south. As the days get warm it is truly all we will need and takes up less room in the pack. Our packs are the same. Mine has needed repairs and some patching, but Jens was of a bit sturdier build and has held up well. I have no complaints though, we put our packs thorough a lot and under the circumstances they have done better than any I have owned. We still carry 32-35liters of gear and food with our packs weighing in at about 30 pounds when full. We did have to purchase new pack covers to fight off the rain, but that is a purchase well worth it’s weight. Our footwear and apparel have had minor alterations. I am currently hiking in the same shoes as Jen, but look forward to getting new shoes in Erwin. The shoes we are in are fine, but my feet are low in volume and have a bit too much room in my current shoes. Jen will also get new shoes in Erwin. We will weigh in on her thoughts at a later time. Our socks are different. We have a new favorite. For a long time we both swore by a certain brand of wool socks. Now, we are swearing by another. Darn Tough wool socks are made in Vermont, and as far as we are concerned… they rock. We are also sporting wool shirts. Last year Jens best friend Alison gave her a wool shirt to hike in. She conquered 1300 miles in that shirt before it needed to be retired. We were in awe at how well it handled both the wear and tear as well as the hiker smell. This section we each have one of these fine garments. They are, as expected, holding up quite well. Mentally, we are better. Our attitude is slightly healthier than before. We no longer just have to put our heads down and hike. We have less pressure due to weather, and enjoy talking about the miles to come. We will do a comprehensive gear post/ review when we are done with the hike, but that requires links etc. that are bit too fancy for the phone. Stay tuned, we will update you in a few days! We finally crossed over the border today into our 12th state! One of the big questions we get about trail life is “what do you eat?” Since we have definitely adapted and improved our diet since we started in Maine, I think it is time to come back to this question. One of our big changes in strategy during this second part of the trail has been food drops. We bought all of our food for the last 800 miles and separated it into 3-6 day groups and shipped them to ourselves in towns along the trail. 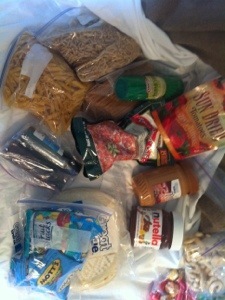 Many gear stores and hostels accept packages for thru hikers along with post offices. So now it has become a game of hiking drop to drop instead of scrambling to find grocery stores or gas stations to buy food and supplies. This has worked well for us because at this point we know what we like. Pop tarts? No thank you. Fruit snacks? Yes please! So here is the breakdown of our breakfasts, lunches, dinners and snacks followed by pics from our last drop. 2) Thai peanut pasta (whole wheat linguini with peanut butter, soy sauce and brown sugar)- so much protein and so filling! 3) Whole wheat pasta with Sundried tomatoes, olive oil and parmesan cheese- delicious!! 5) Lipton Cheddar pasta with broccoli with a packet of tuna mixed in. 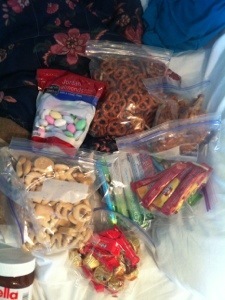 -Mini kitkats, Reese’s peanut butter cups, Jordan almonds, almond joy pieces. Yesterday we passed the 500 miles to Springer mark. Here is our celebration!